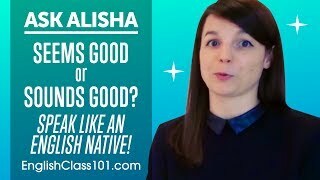 Learn English with EnglishClass101.com - The Fastest, Easiest and Most Fun Way to Learn English Start speaking English in minutes with Audio and Video lessons. EnglishClass101.com is an online English language learning website. With us you'll learn to speak, read, and write English. You'll have fun learning with listeners around the world. Get ready to "wow" your friends, family, teachers and colleagues with the English you'll learn with us! 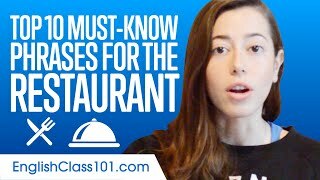 See higher quality videos and with your FREE Lifetime Account at EnglishClass101.com. Want to stay informed? Click "Subscribe" in the red box above and get notifications when a new video is added. Present Progressive or Past Progressive? Continuous Tense Tips! Present Progressive or Past Progressive? 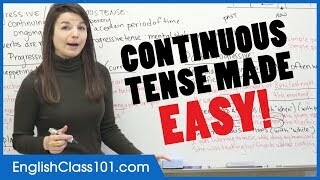 Continuous Tense Tips! 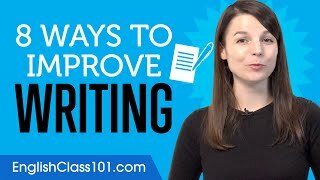 https://goo.gl/BTrSDz Click here and get the best resources online to master English grammar and improve your vocabulary with tons of content for FREE! ↓ Check How Below ↓ Step 1: Go to https://goo.gl/BTrSDz Step 2: Sign up for a Free Lifetime Account - No money, No credit card required Step 3: Learn with the best online resources and quickly become conversational. 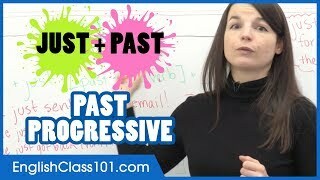 In this English grammar lesson you will learn everything you need to know about continuous tense in English, you’ll know exactly when to use present progressive or past progressive. With this video you will be able to able to improve your English grammar. Are you ready to avoid doing common English mistakes? Our English host gives you easy to understand explanations. This is THE FASTEST way to easily take your English ability to the next level! ■ Facebook: https://www.facebook.com/EnglishClass101 ■ Twitter: https://twitter.com/EnglishClass101 Click here to get started with English: https://goo.gl/BTrSDz Also, please LIKE, SHARE and COMMENT on our videos! We really appreciate it. Thanks! https://goo.gl/yrh39N Click here and get the best resources online to master English grammar and improve your vocabulary with tons of content for FREE! ↓ Check How Below ↓ Step 1: Go to https://goo.gl/yrh39N Step 2: Sign up for a Free Lifetime Account - No money, No credit card required Step 3: Learn with the best online resources and quickly become conversational. 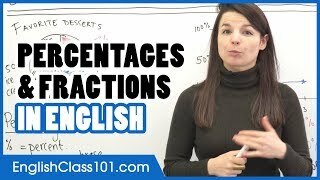 In this English grammar lesson you will learn how to express percentages and fractions in English. 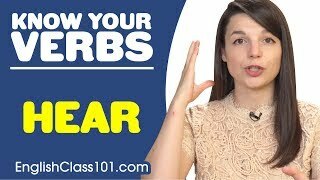 With this video you will be able to able to improve your English grammar. Are you ready to avoid doing common English mistakes? Our English host gives you easy to understand explanations. This is THE FASTEST way to easily take your English ability to the next level! ■ Facebook: https://www.facebook.com/EnglishClass101 ■ Twitter: https://twitter.com/EnglishClass101 Click here to get started with English: https://goo.gl/yrh39N Also, please LIKE, SHARE and COMMENT on our videos! We really appreciate it. Thanks! 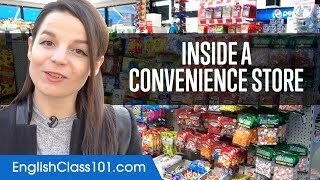 What’s Inside an American Convenience Store? What’s Inside an American Convenience Store? Convenience stores can be found across the United States. Alisha introduces you one of these amazing shops! Master English fast and for FREE at https://bit.ly/2Jkhozx ↓ Check How Below ↓ Step 1: Go to https://bit.ly/2Jkhozx Step 2: Sign up for a Free Lifetime Account - No money, No credit card required Step 3: Learn with the best online resources and quickly become conversational. Some of these convenience store are open 24 hours a day, all year round. They sell a wide range of food and drink including groceries, snack foods, confectionery, but also tobacco products, over-the-counter drugs, toiletries, newspapers, and magazines. 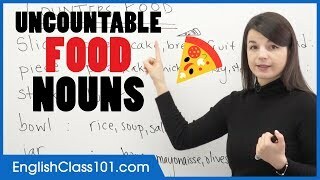 If you are an absolute beginner English learner, this video is made for you. Our host expresses herself in simple English. 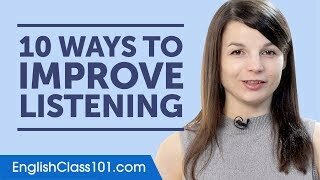 This video will challenge your listening comprehension skills and help you progress in your English study. This is THE place to start if you want to start learning English. ■ Facebook: https://www.facebook.com/EnglishClass101 ■ Twitter: https://twitter.com/Englishclass101 ■ Instagram: https://www.instagram.com/wwwEnglishClass101com/ Also, please LIKE, SHARE and COMMENT on our videos! We really appreciate it. Thanks! https://goo.gl/bxeogR ← If you’re studying English, chances are you’re looking to become fluent and conversational as fast as possible, right? Well then, look no further! 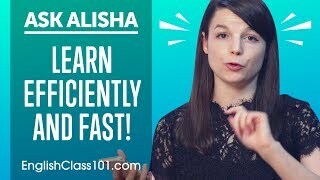 Here is your fast track to fluency ↓ Check how below ↓ Step 1: Go to https://goo.gl/bxeogR Step 2: Sign up for a Free Lifetime Account - No money, No credit card required Step 3: Easily master English grammar and vocabulary With this video, you'll learn 10 ways to improve your english reading skills. 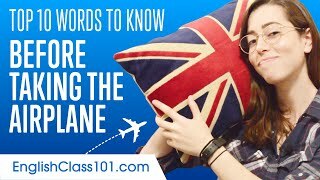 You'll know how to get on your way to English fluency. 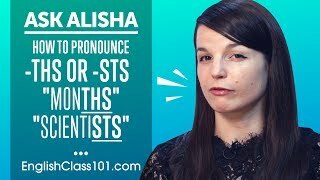 This is the perfect video to get started with English language. ■ Facebook: https://www.facebook.com/EnglishClass101 ■ Twitter: https://twitter.com/EnglishClass101 ■ Instagram: https://www.instagram.com/englishpod101 Click here to get started at EnglishClass101.com: https://goo.gl/bxeogR Also, please LIKE, SHARE and COMMENT on our videos! We really appreciate it. Thanks! 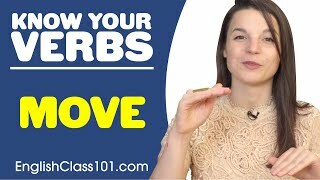 https://goo.gl/uBpRF1 Click here and get the best resources online to master English grammar and improve your vocabulary with tons of content for FREE! ↓ Check How Below ↓ Step 1: Go to https://goo.gl/uBpRF1 Step 2: Sign up for a Free Lifetime Account - No money, No credit card required Step 3: Learn with the best online resources and quickly become conversational. 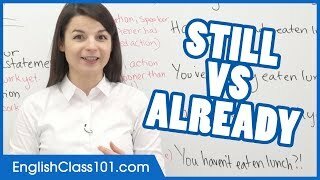 In this English grammar lesson you will learn how to use the "Just" for actions that have finished very recently! With this video you will be able to able to improve your English grammar. Are you ready to avoid doing common English mistakes? Our English host gives you easy to understand explanations. This is THE FASTEST way to easily take your English ability to the next level! ■ Facebook: https://www.facebook.com/EnglishClass101 ■ Twitter: https://twitter.com/EnglishClass101 Click here to get started with English: https://goo.gl/uBpRF1 Also, please LIKE, SHARE and COMMENT on our videos! We really appreciate it. Thanks! https://goo.gl/KPpXzJ ← If you’re studying English, chances are you’re looking to become fluent and conversational as fast as possible, right? Well then, look no further! Here is your fast track to fluency ↓ Check how below ↓ Step 1: Go to https://goo.gl/KPpXzJ Step 2: Sign up for a Free Lifetime Account - No money, No credit card required Step 3: Easily master English grammar and vocabulary With this video, you'll learn 8 ways to improve your english writing skills. You'll know how to get on your way to English fluency. 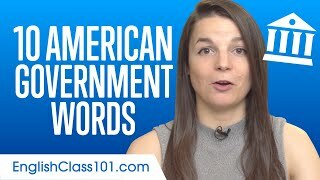 This is the perfect video to get started with English language. ■ Facebook: https://www.facebook.com/EnglishClass101 ■ Twitter: https://twitter.com/EnglishClass101 ■ Instagram: https://www.instagram.com/englishpod101 Click here to get started at EnglishClass101.com: https://goo.gl/KPpXzJ Also, please LIKE, SHARE and COMMENT on our videos! We really appreciate it. Thanks! https://goo.gl/R4HLPE Click here and get the best resources online to master English grammar and improve your vocabulary with tons of content for FREE! ↓ Check How Below ↓ Step 1: Go to https://goo.gl/R4HLPE Step 2: Sign up for a Free Lifetime Account - No money, No credit card required Step 3: Learn with the best online resources and quickly become conversational. 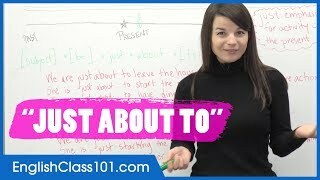 In this English grammar lesson you will learn how to use the "Just" for actions that are going to happen soon! With this video you will be able to able to improve your English grammar. Are you ready to avoid doing common English mistakes? Our English host gives you easy to understand explanations. This is THE FASTEST way to easily take your English ability to the next level! ■ Facebook: https://www.facebook.com/EnglishClass101 ■ Twitter: https://twitter.com/EnglishClass101 Click here to get started with English: https://goo.gl/R4HLPE Also, please LIKE, SHARE and COMMENT on our videos! We really appreciate it. Thanks! https://goo.gl/CpnoF7 ← If you’re studying English, chances are you’re looking to become fluent and conversational as fast as possible, right? Well then, look no further! Here is your fast track to fluency ↓ Check how below ↓ Step 1: Go to https://goo.gl/CpnoF7 Step 2: Sign up for a Free Lifetime Account - No money, No credit card required Step 3: Easily master English grammar and vocabulary With this video, you'll learn 10 ways to improve your english speaking listening. You'll know how to get on your way to English fluency. This is the perfect video to get started with English language. ■ Facebook: https://www.facebook.com/EnglishClass101 ■ Twitter: https://twitter.com/EnglishClass101 ■ Instagram: https://www.instagram.com/englishpod101 Click here to get started at EnglishClass101.com: https://goo.gl/CpnoF7 Also, please LIKE, SHARE and COMMENT on our videos! We really appreciate it. Thanks! 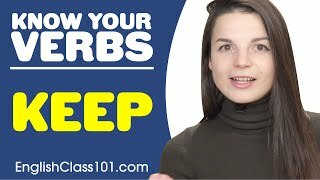 https://goo.gl/D4UpE7 Click here and get the best resources online to master English grammar and improve your vocabulary with tons of content for FREE! ↓ Check How Below ↓ Step 1: Go to https://goo.gl/D4UpE7 Step 2: Sign up for a Free Lifetime Account - No money, No credit card required Step 3: Learn with the best online resources and quickly become conversational. In this English grammar lesson you will learn how to use the adverb “ALMOST” correctly! 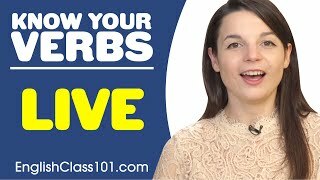 With this video you will be able to able to improve your English grammar. Are you ready to avoid doing common English mistakes? Our English host gives you easy to understand explanations. This is THE FASTEST way to easily take your English ability to the next level! ■ Facebook: https://www.facebook.com/EnglishClass101 ■ Twitter: https://twitter.com/EnglishClass101 Click here to get started with English: https://goo.gl/D4UpE7 Also, please LIKE, SHARE and COMMENT on our videos! We really appreciate it. Thanks! https://goo.gl/mtcmoN ← If you’re studying English, chances are you’re looking to become fluent and conversational as fast as possible, right? Well then, look no further! Here is your fast track to fluency ↓ Check how below ↓ Step 1: Go to https://goo.gl/mtcmoN Step 2: Sign up for a Free Lifetime Account - No money, No credit card required Step 3: Successfully Improve your English with Your Cheat Sheet including vocabulary, grammar and kanji list. Every English learner has learning fears. In this video we're killing the top 4 English learning fears, we tell you what they are and how to overcome them to get on your path to English fluency! You want to study or work in the United States? EnglishClass101 provides everything you need to successfully overcoming them. We give you the best way to learn how to perfectly read, write, and speak English. 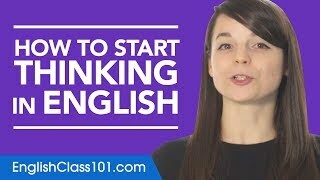 Get started with English: https://goo.gl/mtcmoN ■ Facebook: https://www.facebook.com/EnglishClass101 ■ Twitter: https://twitter.com/EnglishClass101 ■ Tumblr: http://EnglishClass101.tumblr.com/ ■ Instagram: https://www.instagram.com/englishpod101 Also, please LIKE, SHARE and COMMENT on our videos! We really appreciate it. Thanks! https://goo.gl/3uNLom ← If you’re studying English, chances are you’re looking to become fluent and conversational as fast as possible, right? Well then, look no further! Here is your fast track to fluency. To get you FREE gifts, check how below ↓ ➜ Download your Free gifts of January: https://goo.gl/3uNLom ➜ Submit a video or audio recording here and get a FREE 1-month Premium Plus subscription: https://goo.gl/VJC1ve This is your English Monthly Review, in this video not only we will give you 7 tested, timeless ways to learn English, but you will also discover what are the resources you can get for free on EnglishClass101.com! 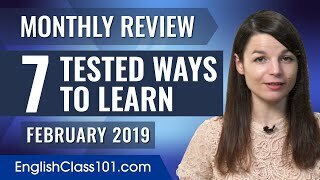 If you are an absolute beginner English learner, this video is made for you as we give you the best learning tips and strategies. This is THE place to start if you want to start learning English. ■ Facebook: https://www.facebook.com/EnglishClass101 ■ Instagram: https://www.instagram.com/englishpod101 ■ Twitter: https://twitter.com/EnglishClass101 Click here to get your free gifts: https://goo.gl/3uNLom Also, please LIKE, SHARE and COMMENT on our videos! We really appreciate it. Thanks! https://goo.gl/c5BFCo Click here and get the best resources online to master English grammar and improve your vocabulary with tons of content for FREE! ↓ Check How Below ↓ Step 1: Go to https://goo.gl/c5BFCo Step 2: Sign up for a Free Lifetime Account - No money, No credit card required Step 3: Learn with the best online resources and quickly become conversational. 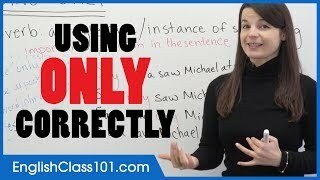 In this English grammar lesson you will learn how to use the adverb “ONLY” correctly! With this video you will be able to able to improve your English grammar. Are you ready to avoid doing common English mistakes? Our English host gives you easy to understand explanations. This is THE FASTEST way to easily take your English ability to the next level! ■ Facebook: https://www.facebook.com/EnglishClass101 ■ Twitter: https://twitter.com/EnglishClass101 Click here to get started with English: https://goo.gl/c5BFCo Also, please LIKE, SHARE and COMMENT on our videos! We really appreciate it. Thanks! 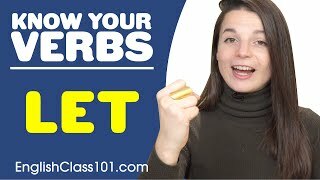 https://goo.gl/9Vw1JT Click here and get the best resources online to master English grammar and improve your vocabulary with tons of content for FREE! ↓ Check How Below ↓ Step 1: Go to https://goo.gl/9Vw1JT Step 2: Sign up for a Free Lifetime Account - No money, No credit card required Step 3: Learn with the best online resources and quickly become conversational. 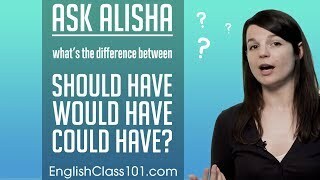 In this English grammar lesson you will learn how to use both Which and That correctly. With this video you will be able to able to improve your English grammar. Are you ready to avoid doing common English mistakes? Our English host gives you easy to understand explanations. This is THE FASTEST way to easily take your English ability to the next level! ■ Facebook: https://www.facebook.com/EnglishClass101 ■ Twitter: https://twitter.com/EnglishClass101 Click here to get started with English: https://goo.gl/9Vw1JT Also, please LIKE, SHARE and COMMENT on our videos! We really appreciate it. Thanks! https://goo.gl/rLPjGD ← If you’re studying Japanese, chances are you’re looking to become fluent and conversational as fast as possible, right? Well then, look no further! Here is your fast track to fluency. 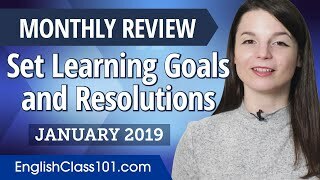 To get you FREE gifts, check how below ↓ ➜ Download your Free gifts of January: https://goo.gl/rLPjGD ➜ Submit a video or audio recording here and get a FREE 1-month Premium Plus subscription: https://goo.gl/hZ4fbX This is your Japanese Monthly Review, in this video not only we will tell you how to train your reading, speaking and writing skills, but you will also discover what are the resources you can get for free on JapanesePod101.com! ■ Facebook: https://www.facebook.com/JapanesePod101 ■ Twitter: https://twitter.com/JapanesePod101 ■ Instagram: https://www.instagram.com/japanesepod101 Click here to get your free gifts: https://goo.gl/rLPjGD Also, please LIKE, SHARE and COMMENT on our videos! We really appreciate it. Thanks! 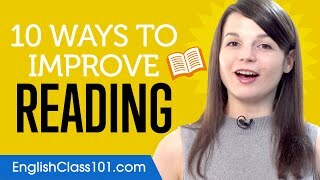 Click here https://goo.gl/ddq3hq and get the best resources online to master English grammar and improve your vocabulary with tons of content for FREE! ↓ Check How Below ↓ Step 1: Go to https://goo.gl/ddq3hq Step 2: Sign up for a Free Lifetime Account - No money, No credit card required Step 3: Learn with the best online resources and quickly become conversational. 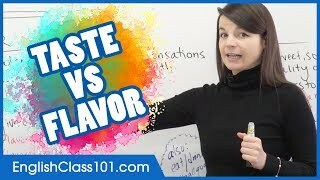 In this English grammar lesson you will learn the differences between TASTE and FLAVOR and how to use them correctly! With this video you will be able to able to improve your English grammar. Are you ready to avoid doing common English mistakes? Our English host gives you easy to understand explanations. This is THE FASTEST way to easily take your English ability to the next level! ■ Facebook: https://www.facebook.com/EnglishClass101 ■ Twitter: https://twitter.com/EnglishClass101 Click here to get started with English: https://goo.gl/ddq3hq Also, please LIKE, SHARE and COMMENT on our videos! We really appreciate it. Thanks! Stop Translating in Your Head and Start Thinking in English! Stop Translating in Your Head and Start Thinking in English! https://goo.gl/KNXsz3 ← If you’re studying English, chances are you’re looking to become fluent and conversational as fast as possible, right? Well then, look no further! 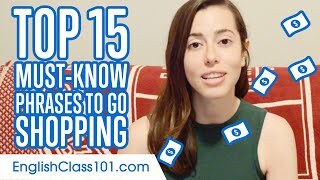 Here is your fast track to fluency ↓ Check how below ↓ Step 1: Go to https://goo.gl/KNXsz3 Step 2: Sign up for a Free Lifetime Account - No money, No credit card required Step 3: Easily master English grammar and vocabulary With this video, you'll learn five 4 ways to start thinking in English! There is no magical, overnight way to learn English. However, doing a few or all of these will help you out substantially. This is the perfect video to get started with English language. ■ Facebook: https://www.facebook.com/EnglishClass101 ■ Twitter: https://twitter.com/EnglishClass101 ■ Tumblr: https://EnglishClass101.tumblr.com ■ Instagram: https://www.instagram.com/englishpod101 Click here to get started at EnglishClass101.com: https://goo.gl/KNXsz3 Also, please LIKE, SHARE and COMMENT on our videos! We really appreciate it. Thanks! 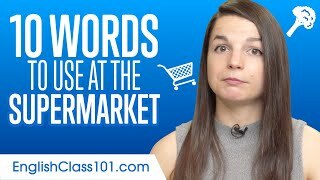 Click here https://goo.gl/JLVdU3 and get the best resources online to master English grammar and improve your vocabulary with tons of content for FREE! ↓ Check How Below ↓ Step 1: Go to https://goo.gl/JLVdU3 Step 2: Sign up for a Free Lifetime Account - No money, No credit card required Step 3: Learn with the best online resources and quickly become conversational. 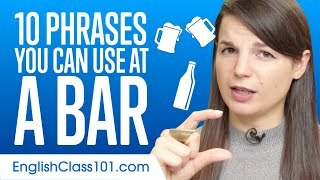 In this English grammar lesson you will learn words used to describe smaller parts of uncountable drinks. With this video you will be able to able to improve your English grammar. Are you ready to avoid doing common English mistakes? Our English host gives you easy to understand explanations. This is THE FASTEST way to easily take your English ability to the next level! ■ Facebook: https://www.facebook.com/EnglishClass101 ■ Twitter: https://twitter.com/EnglishClass101 Click here to get started with English: https://goo.gl/JLVdU3 Also, please LIKE, SHARE and COMMENT on our videos! We really appreciate it. Thanks! https://goo.gl/h2nPpq ← If you’re studying English, chances are you’re looking to become fluent and conversational as fast as possible, right? Well then, look no further! Here is your fast track to fluency ↓ Check how below ↓ Step 1: Go to https://goo.gl/h2nPpq Step 2: Sign up for a Free Lifetime Account - No money, No credit card required Step 3: Easily master English grammar and vocabulary With this video, you'll learn 17 English Movie Quotes! 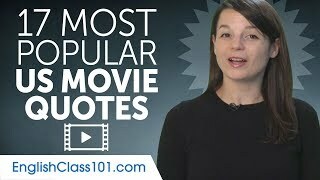 We selected for you the most popular quotes from English movies that you could use to impress native English people! 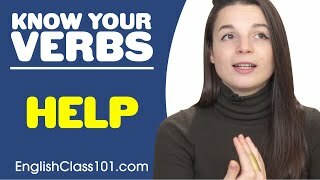 If you are an absolute beginner English learner, this video is made for you. This is THE place to start if you want to start learning English. ■ Facebook: https://www.facebook.com/EnglishClass101 ■ Twitter: https://twitter.com/EnglishClass101 ■ Tumblr: https://EnglishClass101101.tumblr.com ■ Instagram: https://www.instagram.com/EnglishClass101 Click here to get started at EnglishClass101.com: https://goo.gl/h2nPpq Also, please LIKE, SHARE and COMMENT on our videos! We really appreciate it. Thanks! Finally Get Fluent in English with PERSONALIZED Lessons. Get Your Free Lifetime Account: https://goo.gl/YmyqLy ↓ Check how below ↓ Step 1: Go to https://goo.gl/YmyqLy Step 2: Sign up for a Free Lifetime Account - No money, No credit card required Step 3: Start learning English the fast, fun and easy way! Save 20% on FULL Access to EnglishClass101 with your YOUTUBE coupon for All subscriptions https://goo.gl/9D2Jfb ■ Facebook: https://www.facebook.com/EnglishClass101 ■ Twitter: https://twitter.com/EnglishClass101 Click here to find out more about this lesson: https://goo.gl/CKE4ZW Also, please LIKE, SHARE and COMMENT on our videos! We really appreciate it. Thanks! Finally Get Fluent in English with PERSONALIZED Lessons. Get Your Free Lifetime Account: https://goo.gl/MpnKt7 ↓ Check how below ↓ Step 1: Go to https://goo.gl/MpnKt7 Step 2: Sign up for a Free Lifetime Account - No money, No credit card required Step 3: Start learning English the fast, fun and easy way! Save 20% on FULL Access to EnglishClass101 with your YOUTUBE coupon for All subscriptions https://goo.gl/FnW1V1 ■ Facebook: https://www.facebook.com/EnglishClass101 ■ Twitter: https://twitter.com/EnglishClass101 Click here to find out more about this lesson: https://goo.gl/pvaUDq Also, please LIKE, SHARE and COMMENT on our videos! We really appreciate it. Thanks! 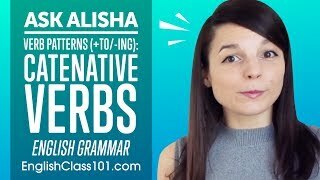 Click here https://goo.gl/B2PFJR and get the best resources online to master English grammar and improve your vocabulary with tons of content for FREE! ↓ Check How Below ↓ Step 1: Go to https://goo.gl/B2PFJR Step 2: Sign up for a Free Lifetime Account - No money, No credit card required Step 3: Learn with the best online resources and quickly become conversational. 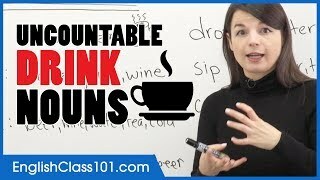 In this English grammar lesson you will learn words used to describe smaller parts of uncountable nouns. With this video you will be able to able to improve your English grammar. Are you ready to avoid doing common English mistakes? Our English host gives you easy to understand explanations. This is THE FASTEST way to easily take your English ability to the next level! ■ Facebook: https://www.facebook.com/EnglishClass101 ■ Twitter: https://twitter.com/EnglishClass101 Click here to get started with English: https://goo.gl/B2PFJR Also, please LIKE, SHARE and COMMENT on our videos! We really appreciate it. Thanks! Finally Get Fluent in English with PERSONALIZED Lessons. Get Your Free Lifetime Account: https://goo.gl/9D7MQC ↓ Check how below ↓ Step 1: Go to https://goo.gl/9D7MQC Step 2: Sign up for a Free Lifetime Account - No money, No credit card required Step 3: Start learning English the fast, fun and easy way! Save 20% on FULL Access to EnglishClass101 with your YOUTUBE coupon for All subscriptions https://goo.gl/qbVcDj ■ Facebook: https://www.facebook.com/EnglishClass101 ■ Twitter: https://twitter.com/EnglishClass101 Click here to find out more about this lesson: https://goo.gl/toB6fZ Also, please LIKE, SHARE and COMMENT on our videos! We really appreciate it. Thanks! Finally Get Fluent in English with PERSONALIZED Lessons. Get Your Free Lifetime Account: https://goo.gl/tRwbLi ↓ Check how below ↓ Step 1: Go to https://goo.gl/tRwbLi Step 2: Sign up for a Free Lifetime Account - No money, No credit card required Step 3: Start learning English the fast, fun and easy way! 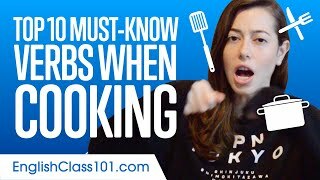 Save 20% on FULL Access to EnglishClass101 with your YOUTUBE coupon for All subscriptions https://goo.gl/Z8H5cE ■ Facebook: https://www.facebook.com/EnglishClass101 ■ Twitter: https://twitter.com/EnglishClass101 Click here to find out more about this lesson: https://goo.gl/7sVH1r Also, please LIKE, SHARE and COMMENT on our videos! We really appreciate it. Thanks! Finally Get Fluent in English with PERSONALIZED Lessons. Get Your Free Lifetime Account: https://goo.gl/fB5cTJ ↓ Check how below ↓ Step 1: Go to https://goo.gl/fB5cTJ Step 2: Sign up for a Free Lifetime Account - No money, No credit card required Step 3: Start learning English the fast, fun and easy way! 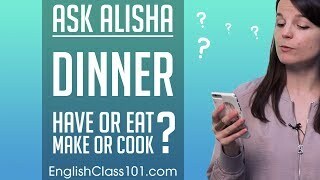 Save 20% on FULL Access to EnglishClass101 with your YOUTUBE coupon for All subscriptions https://goo.gl/vxR7V2 ■ Facebook: https://www.facebook.com/EnglishClass101 ■ Twitter: https://twitter.com/EnglishClass101 Click here to find out more about this lesson: https://goo.gl/aEFmLY Also, please LIKE, SHARE and COMMENT on our videos! We really appreciate it. Thanks! 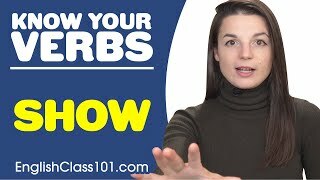 Click here https://goo.gl/mR2JDW and get the best resources online to master English grammar and improve your vocabulary with tons of content for FREE! ↓ Check How Below ↓ Step 1: Go to https://goo.gl/mR2JDW Step 2: Sign up for a Free Lifetime Account - No money, No credit card required Step 3: Learn with the best online resources and quickly become conversational. In this English grammar lesson you will learn how and when to use the English adverbs of time STILL and YET. With this video you will be able to able to improve your English grammar. Are you ready to avoid doing common English mistakes? Our English host gives you easy to understand explanations. This is THE FASTEST way to easily take your English ability to the next level! ■ Facebook: https://www.facebook.com/EnglishClass101 ■ Twitter: https://twitter.com/EnglishClass101 Click here to get started with English: https://goo.gl/mR2JDW Also, please LIKE, SHARE and COMMENT on our videos! We really appreciate it. Thanks! Finally Get Fluent in English with PERSONALIZED Lessons. Get Your Free Lifetime Account: https://goo.gl/zCuG6g ↓ Check how below ↓ Step 1: Go to https://goo.gl/zCuG6g Step 2: Sign up for a Free Lifetime Account - No money, No credit card required Step 3: Start learning English the fast, fun and easy way! Save 20% on FULL Access to EnglishClass101 with your YOUTUBE coupon for All subscriptions https://goo.gl/5fRmD5 ■ Facebook: https://www.facebook.com/EnglishClass101 ■ Twitter: https://twitter.com/EnglishClass101 Click here to find out more about this lesson: https://goo.gl/oiMzxP Also, please LIKE, SHARE and COMMENT on our videos! We really appreciate it. Thanks! Finally Get Fluent in English with PERSONALIZED Lessons. Get Your Free Lifetime Account: https://goo.gl/99xG8z ↓ Check how below ↓ Step 1: Go to https://goo.gl/99xG8z Step 2: Sign up for a Free Lifetime Account - No money, No credit card required Step 3: Start learning English the fast, fun and easy way! Save 20% on FULL Access to EnglishClass101 with your YOUTUBE coupon for All subscriptions https://goo.gl/AFGmDd ■ Facebook: https://www.facebook.com/EnglishClass101 ■ Twitter: https://twitter.com/EnglishClass101 Click here to find out more about this lesson: https://goo.gl/98d3KU Also, please LIKE, SHARE and COMMENT on our videos! We really appreciate it. Thanks! Finally Get Fluent in English with PERSONALIZED Lessons. Get Your Free Lifetime Account: https://goo.gl/8d5zWr ↓ Check how below ↓ Step 1: Go to https://goo.gl/8d5zWr Step 2: Sign up for a Free Lifetime Account - No money, No credit card required Step 3: Start learning English the fast, fun and easy way! 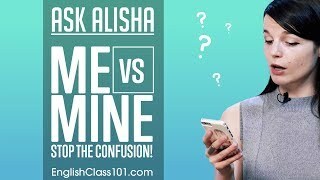 Save 20% on FULL Access to EnglishClass101 with your YOUTUBE coupon for All subscriptions https://goo.gl/b394Fn ■ Facebook: https://www.facebook.com/EnglishClass101 ■ Twitter: https://twitter.com/EnglishClass101 Click here to find out more about this lesson: https://goo.gl/UVyayF Also, please LIKE, SHARE and COMMENT on our videos! We really appreciate it. Thanks! Finally Get Fluent in English with PERSONALIZED Lessons. Get Your Free Lifetime Account: https://goo.gl/yCW6MA ↓ Check how below ↓ Step 1: Go to https://goo.gl/yCW6MA Step 2: Sign up for a Free Lifetime Account - No money, No credit card required Step 3: Start learning English the fast, fun and easy way! Save 20% on FULL Access to EnglishClass101 with your YOUTUBE coupon for All subscriptions https://goo.gl/Ahjggt ■ Facebook: https://www.facebook.com/EnglishClass101 ■ Twitter: https://twitter.com/EnglishClass101 Click here to find out more about this lesson: https://goo.gl/57rzok Also, please LIKE, SHARE and COMMENT on our videos! We really appreciate it. Thanks! Finally Get Fluent in English with PERSONALIZED Lessons. Get Your Free Lifetime Account: https://goo.gl/gychz7 ↓ Check how below ↓ Step 1: Go to https://goo.gl/gychz7 Step 2: Sign up for a Free Lifetime Account - No money, No credit card required Step 3: Start learning English the fast, fun and easy way! 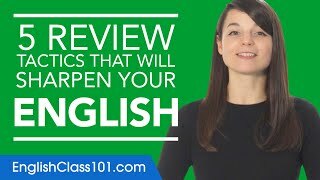 Save 20% on FULL Access to EnglishClass101 with your YOUTUBE coupon for All subscriptions https://goo.gl/rby1bh ■ Facebook: https://www.facebook.com/EnglishClass101 ■ Twitter: https://twitter.com/EnglishClass101 Click here to find out more about this lesson: https://goo.gl/csbPNt Also, please LIKE, SHARE and COMMENT on our videos! We really appreciate it. Thanks! Click here https://goo.gl/oYkict and get the best resources online to master English grammar and improve your vocabulary with tons of content for FREE! ↓ Check How Below ↓ Step 1: Go to https://goo.gl/oYkict Step 2: Sign up for a Free Lifetime Account - No money, No credit card required Step 3: Learn with the best online resources and quickly become conversational. In this English grammar lesson you will learn how to express the cause or the reason by using BECAUSE OF and THANKS TO. With this video you will be able to able to improve your English grammar. Are you ready to avoid doing common English mistakes? Our English host gives you easy to understand explanations. This is THE FASTEST way to easily take your English ability to the next level! ■ Facebook: https://www.facebook.com/EnglishClass101 ■ Twitter: https://twitter.com/EnglishClass101 Click here to get started with English: https://goo.gl/oYkict Also, please LIKE, SHARE and COMMENT on our videos! We really appreciate it. Thanks! https://goo.gl/AAQ1EP ← If you’re studying English, chances are you’re looking to become fluent and conversational as fast as possible, right? Well then, look no further! Here is your fast track to fluency. 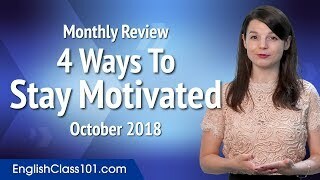 To get you FREE gifts, check how below ↓ ➜ Submit a video or audio recording here and get a FREE 3-month Premium Plus subscription: https://goo.gl/SezP1c ➜ Download your Free gifts of October: https://goo.gl/eRUXsN This is your English Monthly Review, in this video not only we will tell you how to stay motivated when learning a language, but you will also discover what are the resources you can get for free on EnglishClass101.com! ■ Facebook: https://www.facebook.com/EnglishClass101 ■ Twitter: https://twitter.com/EnglishClass101 Click here to get your free gifts: https://goo.gl/eRUXsN Also, please LIKE, SHARE and COMMENT on our videos! We really appreciate it. Thanks! Finally Get Fluent in English with PERSONALIZED Lessons. Get Your Free Lifetime Account: https://goo.gl/3X4G8R ↓ Check how below ↓ Step 1: Go to https://goo.gl/3X4G8R Step 2: Sign up for a Free Lifetime Account - No money, No credit card required Step 3: Start learning English the fast, fun and easy way! 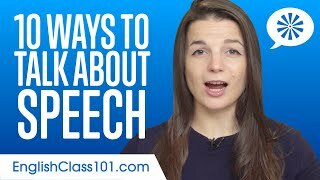 Save 20% on FULL Access to EnglishClass101 with your YOUTUBE coupon for All subscriptions https://goo.gl/45S6LV ■ Facebook: https://www.facebook.com/EnglishClass101 ■ Twitter: https://twitter.com/EnglishClass101 Click here to find out more about this lesson: https://goo.gl/MWDFBu Also, please LIKE, SHARE and COMMENT on our videos! We really appreciate it. Thanks! Finally Get Fluent in English with PERSONALIZED Lessons. Get Your Free Lifetime Account: https://goo.gl/axpnL1 ↓ Check how below ↓ Step 1: Go to https://goo.gl/axpnL1 Step 2: Sign up for a Free Lifetime Account - No money, No credit card required Step 3: Start learning English the fast, fun and easy way! Save 20% on FULL Access to EnglishClass101 with your YOUTUBE coupon for All subscriptions https://goo.gl/6yxsuG ■ Facebook: https://www.facebook.com/EnglishClass101 ■ Twitter: https://twitter.com/EnglishClass101 Click here to find out more about this lesson: https://goo.gl/6ifzW5 Also, please LIKE, SHARE and COMMENT on our videos! We really appreciate it. Thanks! 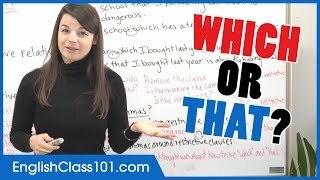 Are you learning English thanks to or because of EnglishClass101? Click here https://goo.gl/UoiWQn and get your TOEIC strategies guide to have a great result at this English exam! ↓ Check How Below ↓ Step 1: Go to https://goo.gl/UoiWQn Step 2: Sign up for a Free Lifetime Account - No money, No credit card required Step 3: Learn with the best online resources and quickly become conversational. In this English grammar lesson you will how to express the cause or the reason by using BECAUSE OF and THANKS TO. 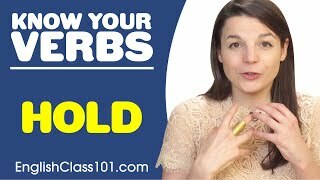 With this video you will be able to able to improve your English grammar. Are you ready to avoid doing common English mistakes? Our English host gives you easy to understand explanations. This is THE FASTEST way to easily take your English ability to the next level! ■ Facebook: https://www.facebook.com/EnglishClass101 ■ Twitter: https://twitter.com/EnglishClass101 Click here to get started with English: https://goo.gl/UoiWQn Also, please LIKE, SHARE and COMMENT on our videos! We really appreciate it. Thanks! Improve Your English Vocabulary Fast! Improve Your English Vocabulary Fast! Finally Get Fluent in English with PERSONALIZED Lessons. Get Your Free Lifetime Account: https://goo.gl/QqKMYJ ↓ Check how below ↓ Step 1: Go to https://goo.gl/QqKMYJ Step 2: Sign up for a Free Lifetime Account - No money, No credit card required Step 3: Start learning English the fast, fun and easy way! Save 20% on FULL Access to EnglishClass101 with your YOUTUBE coupon for All subscriptions https://goo.gl/N6f2M5 ■ Facebook: https://www.facebook.com/EnglishClass101 ■ Twitter: https://twitter.com/EnglishClass101 Click here to find out more about this lesson: https://goo.gl/ah9Y5F Also, please LIKE, SHARE and COMMENT on our videos! We really appreciate it. Thanks! Finally Get Fluent in English with PERSONALIZED Lessons. Get Your Free Lifetime Account: https://goo.gl/bMYKaH ↓ Check how below ↓ Step 1: Go to https://goo.gl/bMYKaH Step 2: Sign up for a Free Lifetime Account - No money, No credit card required Step 3: Start learning English the fast, fun and easy way! 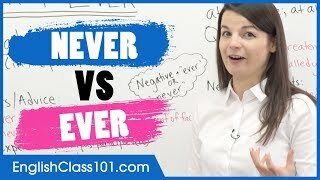 Save 20% on FULL Access to EnglishClass101 with your YOUTUBE coupon for All subscriptions https://goo.gl/jnegAQ ■ Facebook: https://www.facebook.com/EnglishClass101 ■ Twitter: https://twitter.com/EnglishClass101 Click here to find out more about this lesson: https://goo.gl/NSwoms Also, please LIKE, SHARE and COMMENT on our videos! We really appreciate it. Thanks! Finally Get Fluent in English with PERSONALIZED Lessons. Get Your Free Lifetime Account: https://goo.gl/Ytvhzq ↓ Check how below ↓ Step 1: Go to https://goo.gl/Ytvhzq Step 2: Sign up for a Free Lifetime Account - No money, No credit card required Step 3: Start learning English the fast, fun and easy way! Save 20% on FULL Access to EnglishClass101 with your YOUTUBE coupon for All subscriptions https://goo.gl/KVsLnc ■ Facebook: https://www.facebook.com/EnglishClass101 ■ Twitter: https://twitter.com/EnglishClass101 Click here to find out more about this lesson: https://goo.gl/CUgiCP Also, please LIKE, SHARE and COMMENT on our videos! We really appreciate it. Thanks! Should you be using ABOUT or AROUND? Click here https://goo.gl/RRXzzT and get your TOEIC strategies guide to have a great result at this English exam! ↓ Check How Below ↓ Step 1: Go to https://goo.gl/RRXzzT Step 2: Sign up for a Free Lifetime Account - No money, No credit card required Step 3: Learn with the best online resources and quickly become conversational. 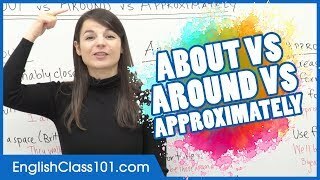 In this English grammar lesson you will learn how to use approximation through words like ABOUT, AROUND or APPROXIMATELY. With this video you will be able to able to improve your English grammar. Are you ready to avoid doing common English mistakes? Our English host gives you easy to understand explanations. This is THE FASTEST way to easily take your English ability to the next level! ■ Facebook: https://www.facebook.com/EnglishClass101 ■ Twitter: https://twitter.com/EnglishClass101 Click here to get started with English: https://goo.gl/RRXzzT Also, please LIKE, SHARE and COMMENT on our videos! We really appreciate it. Thanks! Finally Get Fluent in English with PERSONALIZED Lessons. Get Your Free Lifetime Account: https://goo.gl/FSKDfC ↓ Check how below ↓ Step 1: Go to https://goo.gl/FSKDfC Step 2: Sign up for a Free Lifetime Account - No money, No credit card required Step 3: Start learning English the fast, fun and easy way! 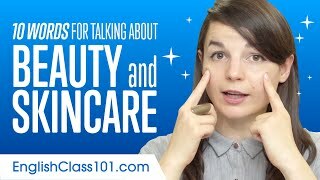 Save 20% on FULL Access to EnglishClass101 with your YOUTUBE coupon for All subscriptions https://goo.gl/p39urd ■ Facebook: https://www.facebook.com/EnglishClass101 ■ Twitter: https://twitter.com/EnglishClass101 ■ Bridget’s Instagram: https://www.instagram.com/bridget_barbara/ ■ Bridget’s Channel: https://www.youtube.com/bridgetbarbara Click here to find out more about this lesson: https://goo.gl/Wtbwex Also, please LIKE, SHARE and COMMENT on our videos! We really appreciate it. Thanks! Finally Get Fluent in English with PERSONALIZED Lessons. Get Your Free Lifetime Account: https://goo.gl/xBKjTH ↓ Check how below ↓ Step 1: Go to https://goo.gl/xBKjTH Step 2: Sign up for a Free Lifetime Account - No money, No credit card required Step 3: Start learning English the fast, fun and easy way! Save 20% on FULL Access to EnglishClass101 with your YOUTUBE coupon for All subscriptions https://goo.gl/B6YTBq ■ Facebook: https://www.facebook.com/EnglishClass101 ■ Twitter: https://twitter.com/EnglishClass101 Click here to find out more about this lesson: https://goo.gl/5N7igb Also, please LIKE, SHARE and COMMENT on our videos! We really appreciate it. Thanks!